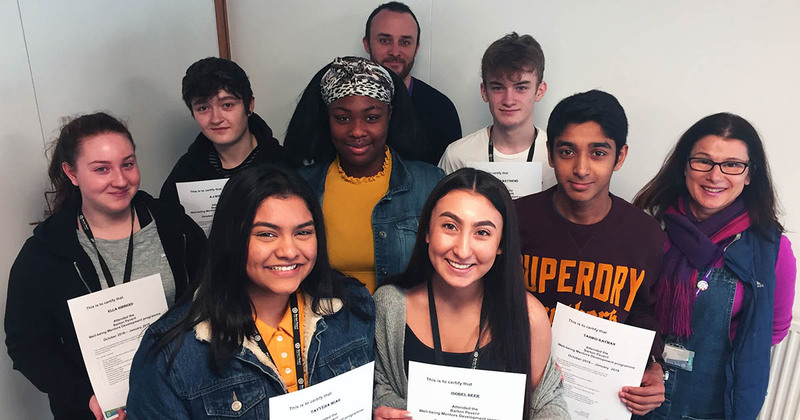 Left to right: Ella Hibberd, AJ Robbins, Tayyeba Miah Caroline Adjare, Teacher of Psychology Keiran Shipperley, Isobel Heer, Callum Matthews, Tak Rayhan and College Counsellor Helen Cunliffe. 15 Barton Peveril Sixth Form College students have become Wellbeing Mentors, after completing the College’s Wellbeing Mentor Development Programme. The programme develops students’ skills in a range of areas, so they can support other students around College with their general wellbeing and mental health. Over the course of the programme, students develop skills in: Anxiety Management, Promoting self-esteem, Recognising Stress, Peer Mentoring, Communication Skills, Understanding Risk, Child Protection and Safeguarding, Utilising Case Studies, and Group Discussion. These Wellbeing mentors will now assist College Counsellor Helen Cunliffe with informal ‘Chance to Chat’ sessions, where students can seek advice and support for any issue they wish to discuss.